Time waits for no man, and time machines haven’t been invented yet. Nevertheless, it seems history can repeat itself. I’ve spent most Saturdays over the past few summers collecting footage for a video or two I want to make about the Pembroke Coast Express. The modern Pembroke Coast Express isn’t too much trouble to film, but to get footage of a steam-hauled one? A steam railtour to Pembroke Dock has run in previous years, but that was before I discovered they existed. This year’s run (2017) was cancelled, but even had it appeared GWR motive power was unlikely to be provided. There was nothing for it; I would just have to cheat and find a suitable GWR locomotive in use elsewhere on the network. Just such an event was scheduled for Saturday 12th August, in Melton Mowbray of all places, along with the Shakespeare Express (Birmingham – Stratford-upon-Avon) on most Sundays throughout the summer so I booked a holiday to fit around these. That holiday started on Friday 11th August, and I started ‘time travelling’ earlier than expected. That time had passed was evident when my grandmother and I arrived at Whitland station. 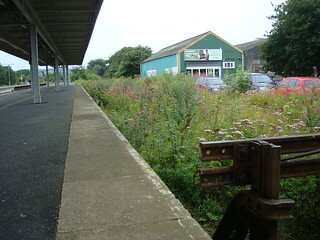 When we were there at the end of March, the track in the disused bay platform had been cleared of vegetation; now the ‘railway garden’ is back in full bloom. 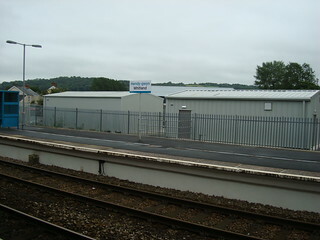 On the other side of the station, two new metal buildings had been erected. These were not on the platform but beyond in the Network Rail maintenance yard, so an enclosed waiting room (much-needed, given this is a junction and potential interchange point) is still a dream. 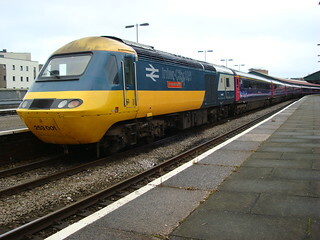 The first leg of our rail journey was a short hop to Carmarthen on board 150283. This was the 09:54 service off Fishguard Harbour, which terminates at Carmarthen (the unit is needed to form a service to Pembroke Dock). 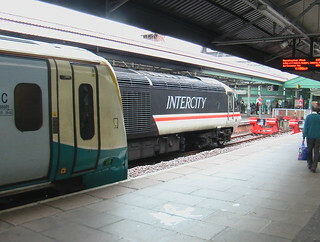 A fairly reasonable connection is available into the 11:03 Carmarthen to Manchester Piccadilly service, which we took as far as Swansea (Arriva Trains Wales provided 3-car unit 175113 on this occasion). It was as we pulled into Swansea (platform 1) that I noticed that our train had taken us back in time. Not literally of course, but standing in platform 2 at the head of a First Great Western Inter-City 125 train was power car number 43002 ‘Sir Kenneth Grange’. This locomotive has been re-liveried in the eye-catching British Rail blue and grey colour scheme that most of the class had from new about 40 years ago. I’ve known that the livery had been restored on 43002 since it was done, but this was the first time I’ve seen it (except perhaps a glimpse at a passing speed of about 250mph while I was on-route to Anglia in March). First Great Western (also known as GWR these days) has also brought back one other BR-era livery, the superb INTERCITY Swallow livery, which is carried by power car 43185 ‘Great Western’. To my surprise this was also in Swansea, at the other end of the very same set. Seeing the two BR-liveried power cars made up for the fact that the Hitachi class 800 test run I had hoped to photograph while in Swansea had failed to materialise, but perhaps not for the fact a class 800 had made a weekday run to Carmarthen in the past few days without my prior knowledge (I had wanted to photograph the class’ first visit). Still, I’m glad I decided on taking the trains I did as I would not have seen the heritage power cars had I set out later as originally planned. The heritage power cars were due out on the 12:29 service to London Paddington, which was our train so I got another chance to try and photograph 43002 when we alighted at Bristol Parkway. Unfortunately, I wasn’t quite fast enough crossing over to the other platform and reached the loco just as it was pulling off, preventing a view of the front. 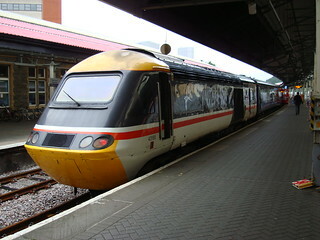 Here we had about 40 minutes to wait for another Intercity 125, the 14:40 CrossCountry service. The original plan would have involved a wait of only ten minutes, but since most XC services on this route are Voyagers (with terrible interiors that are probably as likely to give you a wall to look at rather than a window) I decided to add some contingency time in case of delays. The first time I changed trains at Bristol Parkway I came away with the impression that it was a dreadful station; narrow platforms and no toilets. Since then, I have discovered that there are toilets, plus a reasonable waiting room too. The problem, for passengers changing trains, is that both of those things are outside the ticket barriers. Take the ticket barriers away and you would improve the situation enormously, although the gate attendants did let us out on this occasion to make use of the facilities. Back on the platform; the 14:40 to Glasgow Central duly arrived with its 7 mark 3 carriages. On the front though was something even more surprising than 43002 and 43185 together on our previous train had been; 43043 in full East Midlands Trains livery. On the rear, 43207 in XC livery, was the only loco in my day’s travel that actually matched its coaches. Obviously we weren’t staying on all the way to Glasgow, our destination (and accommodation for the week) was Leicester, but we did ignore the journey planner’s advice to get off at Birmingham New Street. Instead, our return tickets from Whitland only took us as far as Cheltenham Spa. From there, we were covered by a ‘Heart Of England Rover’. 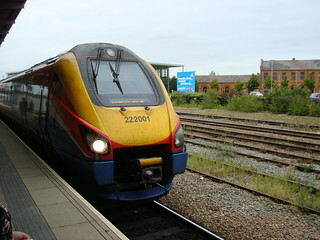 That allowed us to remain on the IC125 until Derby, where we would change onto an actual East Midlands Trains (EMT) service that would take us back south to Leicester. Derby Double: the number ’43’ appears twice in 43043’s loco number. 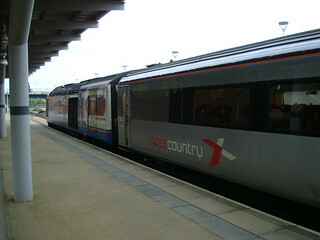 The EMT power car is seen here at Derby on a set of CrossCountry mark 3 coaches. I believe that is a slightly longer route, but I didn’t fancy the change at New Street onto a Leicester-bound Turbostar. At Cheltenham Spa, it turned out, it wasn’t just our return tickets that ran out. Our luck did too. When we boarded the train we found a table with two seats marked ‘Reserved to Cheltenham Spa’ and the other two marked ‘Reserved from Cheltenham Spa’. Ok, we thought, we will just move into the other two seats when we get to Cheltenham. WRONG. At Cheltenham Spa, a party of four boarded and said they had reserved the entire table and indeed the display updated to say all four seats were reserved (I forget where to, perhaps York). I suspected XC’s that controversial ‘advanced purchase on the day’ initiative was at play and asked the group when they had booked. Some time ago apparently, so that wasn’t it. 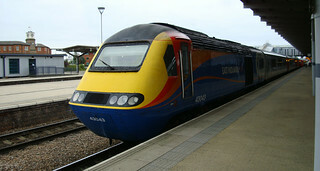 The only remaining explanation is that the reservation displays only show the current reservation, so if one passenger has the seat reserved from Bristol to Cheltenham the sign says ‘reserved to Cheltenham Spa’ regardless of whether somebody else has already reserved the seat from Cheltenham onwards. As a result my grandmother and I were separated for a while, with her finding a seat at a table next to a stranger and me forced to downgrade to an airline-style seat further down the carriage. I can’t remember if we stayed put through to Derby or found a table at Birmingham. Premier Meridian: 222001 arrives at Derby with the London-bound service that took us to Leicester; my first ride on a class 222. The EMT service (17:01 off Derby) was my first time on a Meridian unit (class 222) and, rather fittingly, the Meridian in question was number 222001. Once on-board I discovered that, unlike the ones on an Intercity 125, the overhead luggage racks on a Meridian are not quite large enough to take my suitcase. Fortunately I would not have to contend with that very often, since the case would be left in the hotel room all week until the journey back to Wales. I noticed that 222001 was a named unit, ‘The Entrepreneur Express’. It was also one of EMT’s small fleet of just six 7-car Meridians (the others are mostly 5-car units, with a few 4-car sets too). I don’t think I noticed if there were reservations, like the XC mark 3s we had alighted the Meridians have digital destination displays which are very easy to miss unlike the bits of card on the seat back used for reservations on many other trains.